This tune is a bit different from my usual, but I just love the groove. 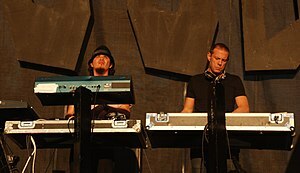 Thievery Corporation is a DC based duo who play with a variety of supporting artists. A touch of Jazz, a morsel of electronica, a dash of reggae, they all combine to create a terrific song. And the song, Lebanese Blonde may bring back memories of a certain hashish from back in the day. This entry was posted in Jazz and tagged Jazz, Lebanese Blonde, Music, Reggae, Thievery Corporation. Bookmark the permalink. Agreed on the “not the usual”. Saw them live two years ago, I think.. They weren’t bad.